thou, in the darkness drear their one true light. The text begins with a proclamation of thanksgiving for the saints ("the cloud of witnesses") who confessed Christ and found in him protection and inspiration (st. 1-2). That proclamation is followed by a prayer for Christ's soldiers on earth to be "faithful, true, and bold" (st. 3). At the crux of the text is the confession of a "blest communion" of saints in heaven and on earth (st. 4). Though the holy warfare may be "fierce and long" (st. 5), "all the saints" may take courage from the vision of a victorious church that worships the triune God on that "more glorious day" (st. 6-7). Similarly, a litany could be constructed from the words of Our World Belongs to God, paragraphs 56-58. Rich testimonies of hope are found in these words! SIXTY-ONE TRUMPET HYMNS & DESCANTS, VOL. 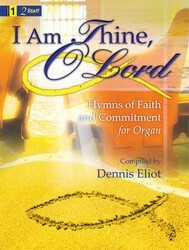 I - Instrumental Book I Am Thine, O Lord (Hymns of Faith and Commitment for Organ) Go to the World! as Lord of heaven and earth. and shared the gifts with which you graced them. from sinners, so that you may not grow weary or lose heart. We praise you, O God, for all your saints in heaven. How grateful we are of the life and witness of . . .
the vast company of voices who acclaim you as Lord. We are grateful for this vast company of witnesses. Strengthen us as we follow their lead. forerunner in faith, Lord of all. will taste and see your goodness in the land of the living. and to the Lamb. Amen! 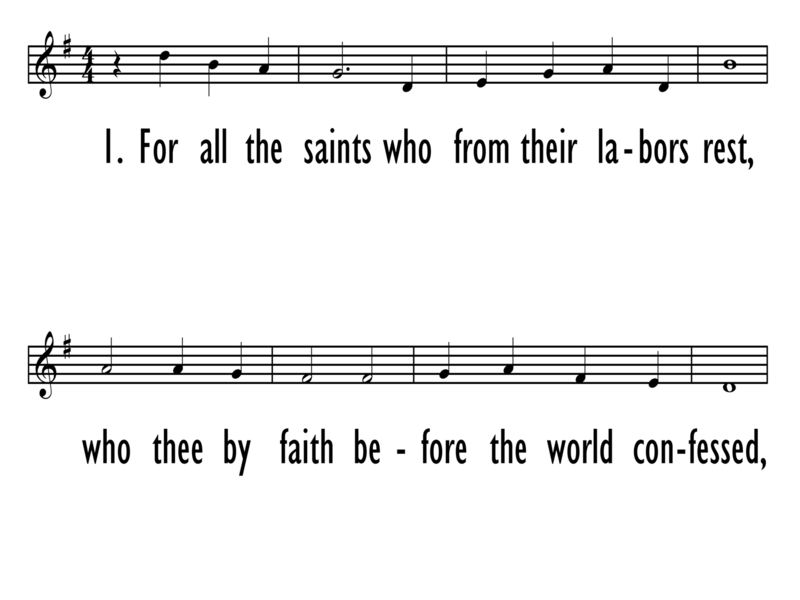 "For All the Saints" is considered to be William W. How's finest hymn text. Originally in eleven stanzas, it was pub­lished in Earl Nelson's Hymns far Saints' Days (1864) with the heading, "Saints' Day Hymn. A Cloud of Witnesses. Heb. 12:1." Inspired by Hebrews 12:1, William W. How’s grand text originally included stanzas for apostles, evangelists, and martyrs. The text begins with a proclamation of thanksgiving for the saints ("the cloud of witnesses") who confessed Christ and found in him protection and inspiration (st. 1-2). At the crux of the text is the confession of a "blest communion" of saints in heaven and on earth (st. 3). Though the holy warfare may be "fierce and long" (st. 4), "all the saints" may take courage from the vision of a victorious church that worships the triune God on that "more glorious day" (st. 5-6). Ralph Vaughan Williams composed the tune, SINE NOMINE, (with its energetic “walking bass”) for this text and published them together in the English Hymnal (1906). Vaughan Williams wrote two harmonizations­–one for unison stanzas and one for choral stanzas. The tune's title means "without name" and follows the Renaissance tradition of naming certain compositions "Sine Nomine" if they were not settings for preexisting tunes. Ralph Vaughan Williams composed the tune (with its energetic “walking bass”) for this text and published them together in the English Hymnal (1906). William W. How (b. Shrewsbury, Shropshire, England, 1823; d. Leenane, County Mayo, Ireland, 1897) studied at Wadham College, Oxford, and Durham University and was ordained in the Church of England in 1847. He served various congregations and became Suffragan Bishop in east London in 1879 and Bishop of Wakefield in 1888. Called both the "poor man's bishop" and "the children's bishop," How was known for his work among the destitute in the London slums and among the factory workers in west Yorkshire. He wrote a number of theological works about controversies surrounding the Oxford Movement and attempted to reconcile biblical creation with the theory of evolution. He was joint editor of Psalms and Hymns (1854) and Church Hymns (1871). While rector in Whittington, How wrote some sixty hymns, including many for chil­dren. His collected Poems and Hymns were published in 1886. Through his composing, conducting, collecting, editing, and teaching, Ralph Vaughan Williams (b. Down Ampney, Gloucestershire, England, 1872; d. St. Marylebone, London, England, 1958) became the chief figure in the realm of English music and church music in the first half of the twentieth century. His education included instruction at the Royal College of Music in London and Trinity College, Cambridge, as well as additional studies in Berlin and Paris. During World War I he served in the army medical corps in France. Vaughan Williams taught music at the Royal College of Music (1920-1940), conducted the Bach Choir in London (1920-1927), and directed the Leith Hill Music Festival in Dorking (1905-1953). A major influence in his life was the English folk song. A knowledgeable collector of folk songs, he was also a member of the Folksong Society and a supporter of the English Folk Dance Society. Vaughan Williams wrote various articles and books, including National Music (1935), and composed numerous arrange­ments of folk songs; many of his compositions show the impact of folk rhythms and melodic modes. His original compositions cover nearly all musical genres, from orchestral symphonies and concertos to choral works, from songs to operas, and from chamber music to music for films. Vaughan Williams's church music includes anthems; choral-orchestral works, such as Magnificat (1932), Dona Nobis Pacem (1936), and Hodie (1953); and hymn tune settings for organ. But most important to the history of hymnody, he was music editor of the most influential British hymnal at the beginning of the twentieth century, The English Hymnal (1906), and coeditor (with Martin Shaw) of Songs of Praise (1925, 1931) and the Oxford Book of Carols (1928).